Apparently, sitting on the floor in Brooklyn is against the law and, if you've got a baby in your arms, watch out! A 23-year-old woman, Jazmine Headley, was at the Human Resources Administration building waiting in line for hours to receive daycare vouchers for her baby so that she could work. There weren't any seats left in the waiting room, and as anyone who has had to care for a 1-year-old knows, it's exhausting to stand for a long period of time holding a baby. So Headley sat on the floor. Security told her sitting on the floor was not permitted, but Headley said without any available chairs she would continue to sit on the floor. She was not blocking any doorways or passageways, but that didn't matter. According to Daily Dot (and as you can see in the video), police jumped all over her, tried to pry her baby away from her, and pandemonium broke out. 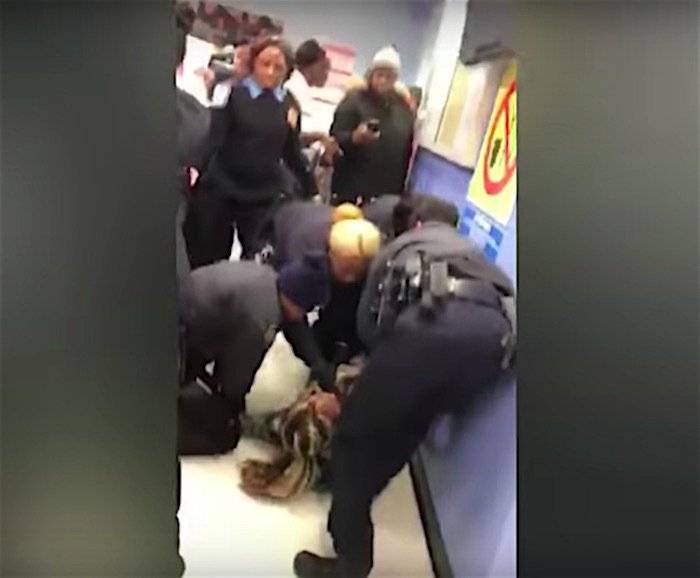 The video shows Headley laying on her back on the ground desperately trying to keep a hold of her son, while screaming, “They’re grabbing my child!” Multiple police officers violently yank on the infant, at the same time, in different directions. People in the office are crowded around the group of officers, screaming at them to stop. People can be heard yelling, “That’s a baby!” and “Look at what they’re doing to her!” Some bystanders even try to get their bodies between the police and Headley. At one point an officer points a stun gun at the people, and then at the Headley, who is on her back on the ground.